The Trans-Pacific Partnership, better known as TPP, may have a negative impact on the supply management of Canadian dairy products, according to a CBC News report. Canadian supply management has been responsible for controlling the levels of national milk production in proportion to Canadian demand. Additionally, foreign competition has been limited by a placement of high tariffs on foreign milk providers. Cue the TPP. If Canadian conservative party representatives choose to participate in the TPP, Canadian borders would be opened to American milk suppliers. 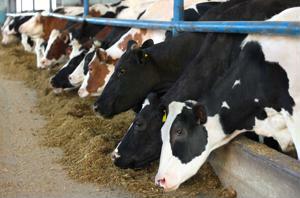 However, access across U.S. borders would not be permitted for Canadian milk suppliers. In an interview with CBC a local Canadian farmer, Clair Doan, Doan relayed the importance of the three pillars of supply management staying intact: domestic needs being met, a sound spend management strategy and import control. Pending approval by the Canadian government, TPP could provide a clear threat to the third pillar of supply management. Doan saw this as an alarming predicament for dairy farmers across Canada. "With one of those pillars being under threat, in my opinion, all of supply management is under threat," said Doan, according to CBC. The Canadian Press reported that about 13,000 dairy farms exist today and the dairy industry employs 215,000 Canadian workers. Wally Smith, president of the Dairy Farmers of Canada, stressed that while DFC does not oppose international trade as a whole, they will not support any trade deal that jeopardizes the coherence of dairy supply management, as reported by the Canadian Press. Federal Agriculture Minister, Gerry Ritz maintained that there would be no negative impact on dairy supply management as reported by Better Farming. Ritz has come under attack by opposition leaders and dairy farmers alike. The TPP is a trade agreement between major international players including the U.S., Canada, Australia and Japan. Details on exactly what the TPP entails have been primarily kept from the public, according to Newsweek.